ASP.NET Core identity allows you to implement authentication and authorization for your web applications. 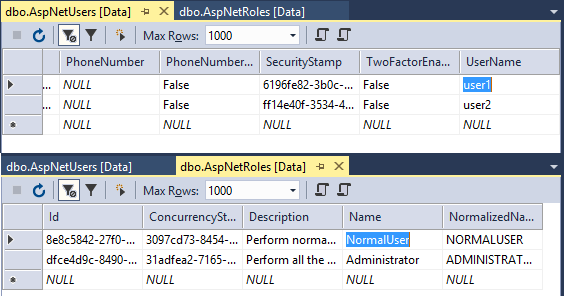 While working with ASP.NET Core Identity at times you need to create default user accounts and roles in the system. In ASP.NET MVC you could have easily done this in Global.asax and Application_Start event handler. In ASP.NET Core the process is bit different since the application startup process is different. To that end this article explains a way to seed such user and roles data in your applications. Before you go any further ensure that you have a web application configured to use ASP.NET Core Identity. I am going to assume that you have followed my earlier article here to implement ASP.NET Core Identity in your web application. The article just mentioned is for ASP.NET Core 1.x but most of the part is same under ASP.NET Core 2.0. So, it should be an easy upgrade for you. Of course, you can use your own implementation also. If you followed my article mentioned above, you already have MyIdentityDbContext, MyIdentityUser and MyIdentityRole classes ready with you. Our aim is to create a few user accounts and a few roles when the application runs for the first time. Obviously, we do this only if those users and roles doesn't exists in the database yet. The former method is simple and straightforward with minimal coding. Just like you inject objects in other parts of your application, you can inject them into the Configure() method also. The later approach is bit complex and requires you to shift the seeding operation to the Main() from Program.cs. As you can see we now inject UserManager and RoleManager into the Configure() method. This way you can use UserManager to create user accounts and RoleManager to create roles at the application startup. Instead of writing code directly inside the Configure() method, we will isolate it in a separate class and then call it from here. The MyIdentityDataInitializer class has three static methods - SeedRoles(), SeedUsers() and SeedData(). If you wish to create both - users and roles - then you would call SeedData(). You can also create only users or only roles using the respective methods. Now, let's see the code that goes inside these methods. This code should be familiar to you because you already wrote something similar in the AccountController (see my earlier article here for example). The SeedRoles() method accepts RoleManager as its parameter. Inside, it creates two roles in the system - NormalUser and Administrator. You should change the role names and their description as per your need. Note that we first check whether a role already exists or not. If it doesn't exist only then we create it. The SeedUsers() method accepts a UserManager and creates two users - user1 and user2. Notice that we first check whether a user with the same name exists or not. If it doesn't exist then we create it with default values of l, full name and birth date. Change these values as per your requirement. Also notice that the user accounts have been assigned certain default roles. The SeedUsers() and SeedRoles() don't return any value. But you can change the signature to return some success or failure status if you so wish. The SeedData() method accepts a UserManager and a RoleManager. Inside, it calls SeedRoles() and SeedUsers(). Note that SeedRoles() is called first because SeedUsers() assigns certain roles to the users being added and those roles must exist in the system prior to adding the users. As you can see after calling UseAuthentication() we call SeedData() on MyIdentityDataInitializer. Here, instead of injecting the UserManager and RoleManager into Configure() you grab them from GetRequiredService() method. The userManager and roleManager objects are then passed to SeedData() as before.